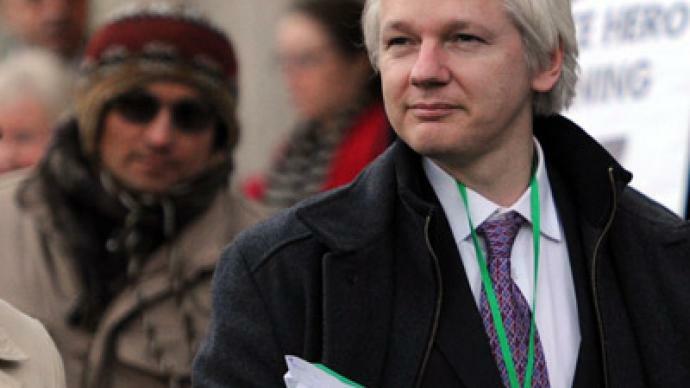 ­Whistleblower Assange is still trapped within the Ecuadorian embassy in London after he chose not to present himself at a police station on Friday morning. “This should not be considered as any sign of disrespect. Under both international and domestic UK law, asylum assessment takes priority over extradition claims,” said lawyer Susan Benn appearing at the Ecuadorian embassy in London on Friday. 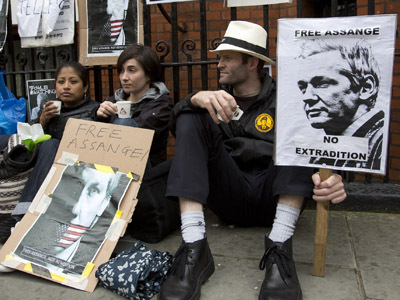 “Julian will remain in the embassy under the protection of the Ecuadorian government while evidence for his application is being assembled and processed,” added Benn. British authorities want to begin extraditing Assange to Sweden over allegations of sexual abuse. The WikiLeaks founder, who is seeking political asylum in Ecuador, fears that once he sets foot in Sweden, he will be extradited further to the US. 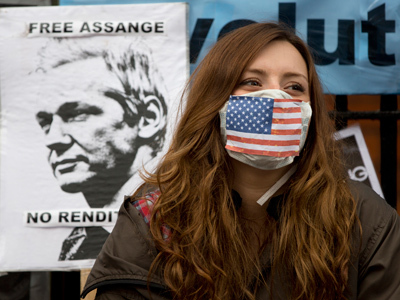 “The US government has instigated a grand jury against Assange and other founders or managers of WikiLeaks. There is irrefutable evidence in the public record of a subpoena being issued and witnesses being compelled to testify against Mr. Assange,” said Benn. WikiLeaks, the ACLU, the Center of Constitutional Rights and other groups have been fighting these subpoenas in multiple US courts, continued the lawyer. Nevertheless, the FBI file on the investigation already exceeds 42,000 pages. Credible reports reveal a sealed indictment has already been made against Assange, Benn also stated. Washington would like to pursue Assange for revealing sensitive information about US military operations in Iraq and Afghanistan. There is also the matter of thousands of leaked diplomatic cables, which have put the US in an uncomfortable position with its allies and partners worldwide. Informal talks between Sweden and the US have already taken place, said Susan Benn, quoting media reports. The UK court accepts that Assange has not been charged with any criminal offence in Sweden or that Swedish authorities could interrogate him on UK soil. 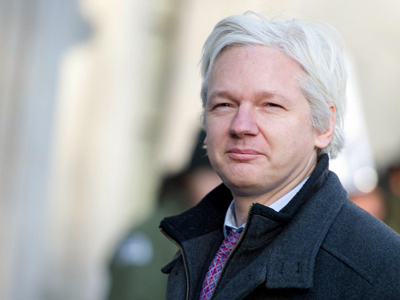 “Although it is a normal procedure, Swedish authorities have refused without reason to take a three-hour trip to London and to interview Julian, causing him to be trapped in the UK under virtual house arrest for 561 days and an additional 10 days in solitary confinement, all without charge,” concluded Benn. 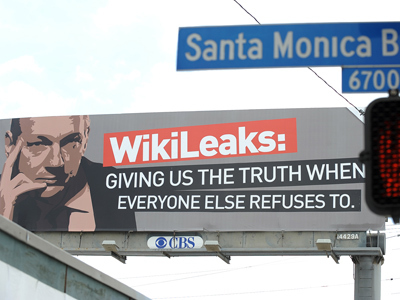 Many remark that the current scandal around Assange is growing bigger than the WikiLeaks revelations themselves. But this may be just a policy to do away with whistleblowers, says Thomas Drake, a US former security agent and a whistleblower himself. People end up being depicted as caricatures. “In the focus comes the person, not the message. Basically you engage the politics of personal destruction. You avoid the more uncomfortable discussions regarding actual messages being brought forth or even what was revealed or disclosed,” Drake told RT. ­Ray McGovern, a former CIA analyst, says unless Assange is granted asylum, US prosecutors getting their hands on him is a done deal. And considering the “draconian espionage act of 1917” under which he would be tried, getting to Ecuador becomes a life and death matter for the WikiLeaks founder. 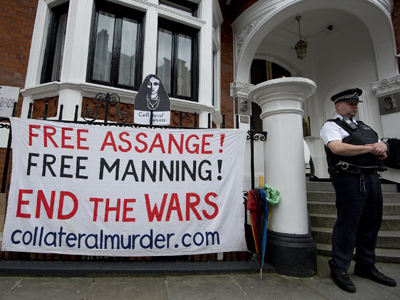 Should Assange be extradited to Sweden, Ray McGovern continued, it will not be long before he is sent to the United States to face the same kind of treatment that Bradley Manning was subjected to. “And that is, you know, [what] the UN rapporteur called ‘conditions equivalent to torture’,” the former CIA analyst concluded.